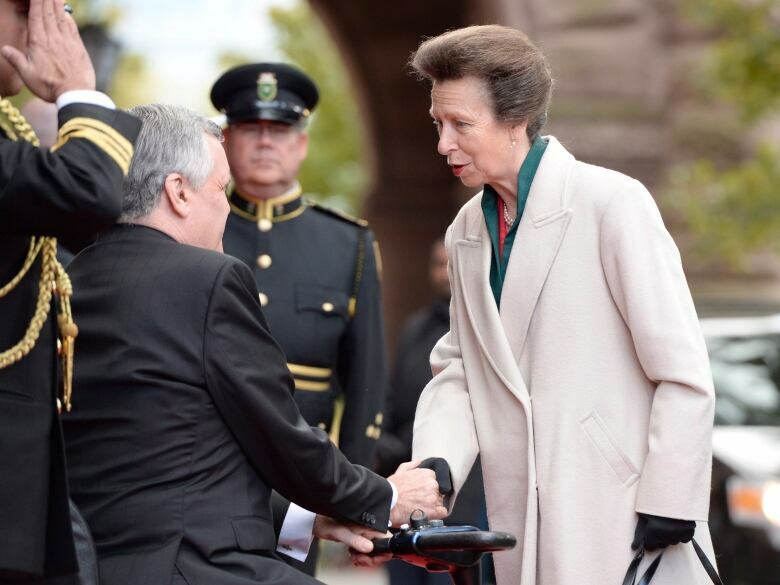 Princess Anne, the Princess Royal, begins a two-day visit in the Ottawa region Monday that includes the annual Remembrance Day ceremony at the National War Memorial and meetings with aboriginal youth, police officers and soldiers. Princess Anne had planned on being in Ottawa for Remembrance Day long before one Canadian soldier was killed in a shooting at the National War Memorial and another died after a targeted hit-and-run in a Quebec parking lot. Now, though, the focus the Princess Royal will place on "everyday heroes," ranging from aboriginal youth to long-serving police officers, will take on an added poignancy. "It’s rather timely," said Kevin MacLeod, the Canadian secretary for Anne's mother, Queen Elizabeth. The "everyday heroes" theme for Anne's brief visit was developed "well before the untimely deaths of Cpl. (Nathan) Cirillo and Warrant Officer (Patrice) Vincent," MacLeod said. So it's a "very fitting and appropriate" theme that will be applied to a royal tour that includes the marking of Remembrance Day, he added. "We will be focusing on those everyday heroes in Canadian society who do extraordinary things in building the future of our society who oftentimes go unnoticed and certainly oftentimes do not receive the credit they should." Anne and her husband, Vice-Admiral Tim Laurence, will be at the National War Memorial for the Remembrance Day ceremony at 11 a.m. Tuesday. It will be one of at least a dozen appearances by Anne during a whirlwind visit that started Monday at noon when the couple arrived at the Ottawa airport from the U.S. and will wrap up 34.5 hours later when they fly home to the United Kingdom. The visit has some of the trappings that could be expected with a royal tour — planting a tree outside Rideau Hall, riding in a Victorian carriage — but much of Anne's short time here is focused on issues and initiatives that have a particular interest for the 64-year-old royal. "She is viewed as one of the hardest-working members of the Royal Family," says Toronto-based royal historian and blogger Carolyn Harris. "She takes on hundreds of public engagements every year and is seen as someone who speaks her mind." That philosophy seems to have been at play in planning this visit, which follows closely on the heels of trips to Australia and Vanuatu, and the United States. "Her credo is 'Keep me busy. I'm here to work. I'm here to do good things. I'm here to meet as many people as possible,' " says MacLeod. "I think that's what you'll see on this royal tour." Among those Anne will meet during her visit are members of the seventh — and most recent — regiment for which she serves as colonel-in-chief: the Royal Canadian Hussars based in Montreal. She'll spend time at the National Military Cemetery and the Canadian Police College, where she will present long-service medals and tour the stables. Those stables have a special tie for the Royal Family — horses provided to them by the RCMP have been trained there. Anne's own equestrian links to Canada run deep. 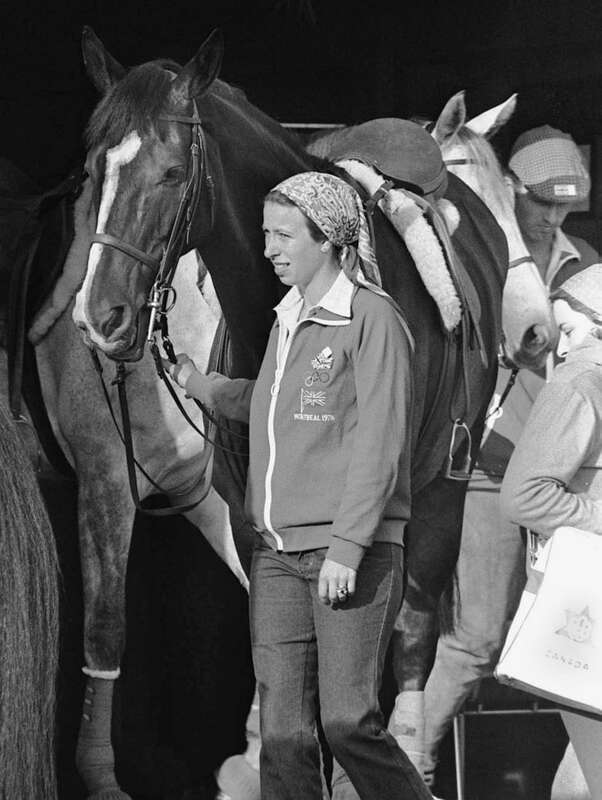 She was a member of the U.K. equestrian team at the 1976 Olympics in Montreal, and her family came to watch her compete. "This attracted a lot of popular interest, seeing the entire Royal Family together," says Harris. Anne's interest in all things equestrian will also be front and centre at Wesley Clover Parks in Nepean. There, she will meet members of the Canadian Therapeutic Riding Association, of which she is patron. Anne will also visit the Ottawa Inuit Children's Centre and the Wabano Centre for Aboriginal Health. At that centre, her visit will focus on an aboriginal youth suicide prevention program underway in Northern Ontario. Anne will meet young people who provide mentorship to other aboriginal youth in crisis. "These issues have to be exposed and they have to be spoken about and they have to be brought to public attention and that's what I think she will be doing when she sits down with those four or five young people at a table and they explain to her what the crisis is in their community," MacLeod said. "That's the real power of what she's going to be undertaking." Anne's visit to the National Capital Region is billed as an "official" one, something Harris says is significant, and which means it comes at the invitation of the prime minister, and not groups or organizations with which Anne has an association. "Since Jean Chrétien became prime minister, official visits have been limited to the monarch and the heir and more recently the monarch, the heir and the second in line to the throne," Harris says. "We may be seeing a trend toward junior members of the Royal Family making official visits to Canada once more." Anne has been to Canada numerous times on lower-profile working visits, the most recent of which was last fall. Her first Canadian visit came in 1970, when she travelled with her parents and brother Prince Charles to the Northwest Territories. It was a "very politically significant visit as there were doubts in the United States about Canada's ability to wield sovereignty over the Arctic, which was a strategic region during the Cold War," says Harris. "So the fact that four senior members of the Royal Family embarked on this tour of the Arctic Circle really demonstrated Canadian sovereignty over the region." Over the years, Anne has been known for her ability to be forthright, and frugal. "For instance, when she was receiving congratulations regarding Prince George, her grand nephew, William and Kate's son, she commented that was lovely but it has nothing to do with me," says Harris, who also noted Anne has attracted headlines for "rewearing dresses that she had worn decades beforehand." There were also headlines around the breakdown of her first marriage to Mark Phillips, but nothing like the tabloid attention directed toward the disintegration of the first marriages of her brothers Charles and Andrew. "Princess Anne and Mark Phillips seemed to have largely attempted to keep their personal problems out of the public eye," says Harris. When MacLeod ponders the question of what Canada means to Princess Anne, he says it's important to place the concept in context. At the heart of that context, even today, is the impact of the Canadian visit by her grandparents, King George VI and his wife Queen Elizabeth, in 1939. 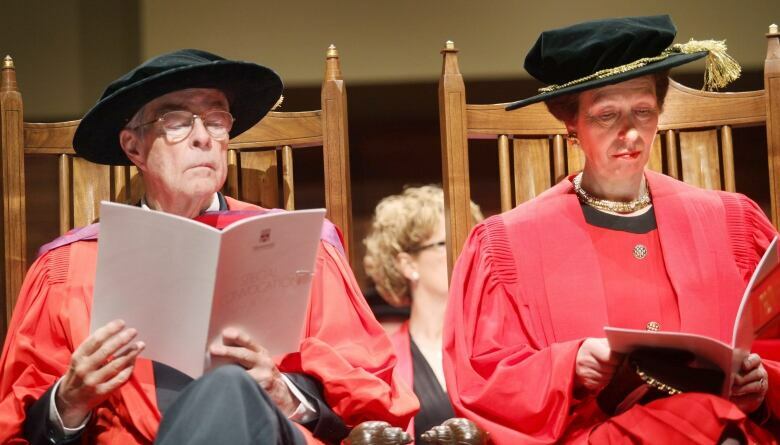 That was the first visit by a reigning monarch and saw the king, who had a stammer, give a clear speech in Winnipeg. "The Queen Mother always looked back on that tour and she always said Canada made us because Canada proved that her husband could serve effectively as sovereign," says MacLeod. "The Queen Mother and her husband always had an abiding affection for this country and I think that came down the generations." Anne's devotion to her duties also echoes that of her mother, the Queen. "Like her mother, the vast majority of her life is dedicated to service," says MacLeod. "Those are core values that sit well with her, and I think that's going to come to the forefront (during the tour) in many ways."